Nolan Brown can see the future home of Transparent Brewing Co. He can literally see it across White Avenue from his job at Gayle’s Harley Davidson in Grandview, Missouri. 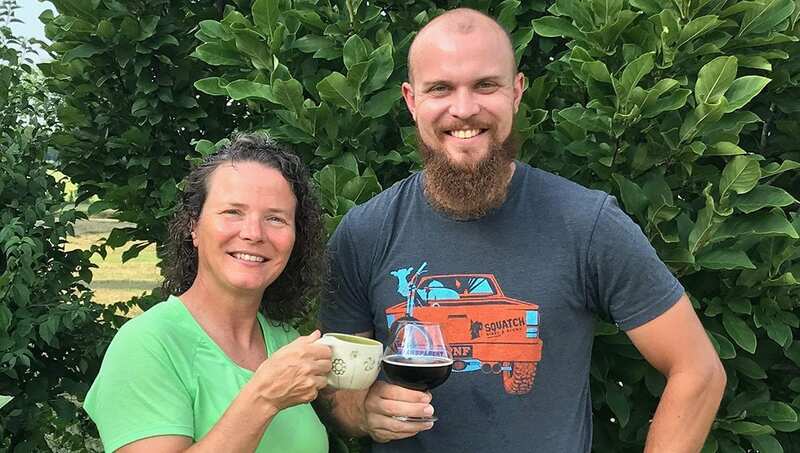 Brown and his mother, Michelle Brown, have been working for the past three years to bring Transparent Brewing Co. and The Chive, Simply Good Café & Market — an attached restaurant — to 14501 White Ave. They’re hoping to open by the summer of 2019. Nolan was on a path to being a doctor when he decided that he wanted a career as a brewer instead. Soon after Nolan told his parents that he wasn’t going to medical school, Michelle decided that she would go to culinary school. While he pursued his dream of becoming a brewer, interning at Six Row and working as a cellarman at The Saint Louis Brewery (then Schlafly) in St. Louis, Michelle enrolled in the culinary arts program at Johnson County Community College. So Michelle built up her garden and began to envision a restaurant focused on locally-sourced ingredients, as Nolan worked at Fossil Cove Brewing Co. in Fayetteville, Arkansas, and at Oskar Blues as a brewer in its North Carolina facility. “The goal was always to open a brewery and then a building suddenly became available in Grandview,” Nolan said. TJ’s Café burned down in 2016 and the contractor working on the site knew the Brown family. When it opens, the brewery and restaurant will share the space and each will have an order counter. The beer will be handed to you and the food will be brought to your table. Nolan is also envisioning a large dog-friendly outdoor space. On the brewery side, Nolan has been working on a Kolsch, session IPA, a pale ale, stout and a vanilla cream ale. Over the past three years, the Browns have been running tastings, roughly one a month, where they try out menu items and beers for invited guests. The Chive’s locavore menu will include vegetables and herbs from Michelle’s own property, known as Echo Farm in Oak Grove, Missouri. Beer has also been informing the menu. Michelle and Nolan have experimented with a stout ice cream, braising meat in beer and using spent grain in baked goods. Is it going to be wine or beer? Louie’s Wine Dive (6701 W. 119th St., Overland Park, Kansas) is hosting a four-course dinner ($60) at 6:30 p.m. on Wednesday, Aug. 22. Each course (tomato gazpacho, potato and chorizo croquettes, Wagyu ribeye, peach cobbler) features an EJ Gallo wine and Martin City Brewing Co. beer. Border Brewing Co. (406 E. 18th St.) has Shiftie IPA (8% ABV) — an American pale ale with some citrus notes — on tap, as well as a mint chocolate milk stout and raspberry chocolate milk stout in bottles. KC Bier Co.’s Oktoberfest is moving to Crown Center. The festival will be two days, Friday, Oct. 5 and Saturday, Oct. 6. It’ll have German beer, food, bands, lawn games and a carnival. Grunauer and Chicken N Pickle will also be serving food. Tickets are on sale now. Martin City Brewing Company’s Fallback American Brown Ale (5.4% ABV, 39 IBUs) is out in cans and on tap this week. The brewery’s tasting profile suggests a “dark ochre, medium-bodied” beer with a “malty sweet, toasty” aroma, and “malty-rich, nutty” flavor. Callsign Brewing Co. (1447 Gentry St., North Kansas City, Missouri) has Screaming Eagle Cream Ale and Huey American Wheat on tap. Tuesdays are game night, where you can play one of the brewery’s board games or bring your own. Big Rip Brewing Company (216 E. Ninth Ave., North Kansas City, Missouri) released Davey Hogan’s Revenge, a blueberry cream ale (so named for that infamous scene in “Stand By Me”) over the weekend. They’ve also just completed a tap room renovation and now have a kiosk where you can order barbecue from Hawg Jaw Que and Brew next door. East Forty Brewing (1201 W. Main St., Blue Springs, Missouri) releases its Blue Springer-Weiss. The Berliner Weisse, a tart brew, can then be doctored up with woodruff, raspberry or pineapple syrup. The shuffleboard tournament is back at Casual Animal Brewing Co. (1725 McGee St.) You can sign up until 4 p.m., and then eight teams of two people battle it out between 5:30 and 7:30 p.m. The winner takes home a crowler of beer. Strange Days Brewing Co. (316 Oak St.) is hosting a benefit for Turn The Page, a youth literacy program started by Mayor Sly James. Bring a book, and you’ll get half-off your first beer between 3 and 10 p.m. Fringe Beerworks (224 SE Douglas St., Lee’s Summit, Missouri) is paying homage to the brews of Kansas City in honor of 8/16. They’ll have 23 taps of KC brews from the 816 area code and will celebrate with area brewery representatives between 6 and 10 p.m.
It’s National Black Cat Day and Crane Brewing Company (6515 Railroad St., Raytown, Missouri) will celebrate with $2 pints of Omar, the brewery’s English Porter. Sancho Streetside will also be there with four pairings, including braised short ribs with beer cheese to go with Omar. Grinders Stonewall (10240 Pflumm Road, Lenexa, Kansas) is hosting a dodgeball tournament. They’ll figure out the teams at noon, and the first ball will be thrown at 1 p.m. Historic Downtown Liberty, Inc. (117B N. Main St., Liberty, Missouri) is hosting a Dog Days of Summer Craft Beer Crawl ($20) from 3 to 7 p.m. Pick up your glass from their office and then sip and shop around downtown Liberty with your tasting glass in hand. The Kansas City Roller Warriors are hosting The Dog Days of Summer Series with live roller derby at Memorial Hall (600 N. Seventh St., Kansas City, Kansas) from 4 to 9 p.m. The 4 to 5 p.m. hour is key because that is when $1 hot dogs and beers are served. The matches start at 5 p.m. Crows Coffee (304 E. 51st St., 7440 Washington St.) has made happy hour a daily occurrence. Get $2 off beer or wine between 4 and 6 p.m. daily.